Polnoye sobraniye sochineniy V A Zhukovskago. 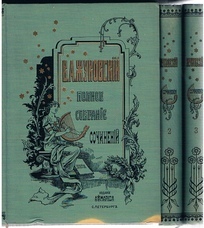 Pod redaktsiye ... A S in three volumes. A very nice 3 volume set in excellent condition; bright, clean and tight. Original pictorial cloth, decorated in gilt and black, marbled edges, floral design to endpapers, silk markers. Tissue protected frontis. to volume one. Minor fading to lower edge of volume one with small bump beside. ; Foremost poet of the early nineteenth century, Zhukovsky is generally regarded as having introduced the Romantic Movement to Russia. Posle Stalina. Nasledniki Stalina, Babii Iar i Drugiye. Vvedeniye Prof. A.
Pis'ma A I Ertelia. : Pod redaktziei i s predisloviem' M. O. Gershenzona.